the knobs are great. i have used them on 5 different homes and reordered again. "6-inch Rectangular Design Bar Pull Handle for Bathroom and Kitchen Cabinets. 4-inch Hole to Hole Spacing. Solid Hard Aluminum Anodizing. Black Finish. Offer a modern touch to any style of cabinetry. Mounting screws included. • 6 inch Rectangular Design Stainless Steel Black Finish Cabinet Handle Bar Pull. •Stylish rectangular modern design in Black Finish. •Made with Solid Hard Aluminum Anodizing which avoids corrosion, color fading and increase surface hardness. •Matte Black finish. •1 inches cabinet mounting screws included. 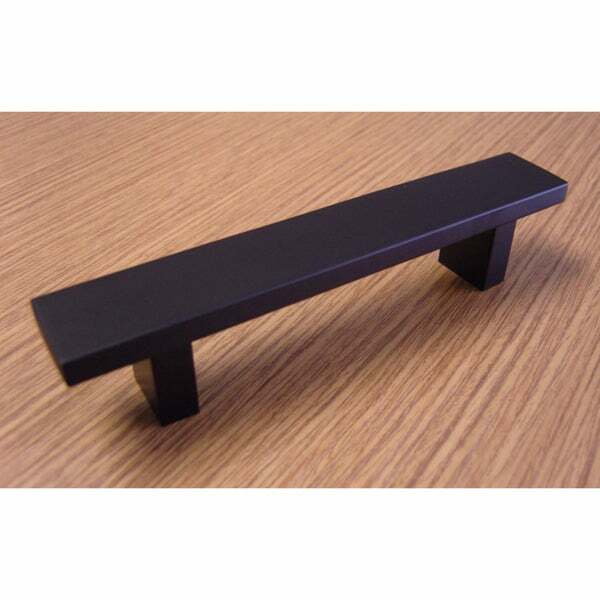 6 inch Rectangular Design Matte Black Finish Cabinet Handle Bar Pull. Made with Solid Hard Aluminum Anodizing which avoids corrosion, color fading and increase surface hardness. So this pull has a great, modern look we were after for our new kitchen cabinets. We liked them enough to place a second order for a bathroom vanity. There is only one issue I have with these. They are, as they appear in the image and description, rectangular, including the two spacers the screws go into. The spacers are also rectangular... BUT THEY TWIST! So, you have to loosen the screw, hold the spacer straight, and then carefully re-tighten the screws so it doesn't twist out of square when tightened. A bit inconvenient, but I am still happy with them overall. These were exactly as stated and received in a timely fashion. Easy to install. We made a template and had no trouble. They are beautiful! Would definitely recommend! I was looking for some modern/contemporary hardware and I came upon these. They are amazing. They look great with my lighter gray cabinets and black slate floors. I am very pleased with the quality of these pulls. I just replaced my cabinets with all white. I was going to do all pulls but these are very bold and have decided to do a combination of pulls and knobs. classic look - perfect size for front of sink! "Do these pulls come in a size smaller than 6"?"